Breakfast. It’s the most important meal of the day – right? But published scientific research is now proving otherwise. Here are 3 myths we’ve all been programmed to believe about eating breakfast for long term health and weight loss. The whole idea that not eating a big breakfast will somehow slow down your metabolism is simply not true. In a recent paper published in the American Journal of Clinical Nutrition , researchers delved into dozens of studies to uncover the relationship between eating breakfast and increased metabolic rate. The researchers divided 309 overweight and obese (but otherwise healthy adults) into two groups to specifically find out whether eating or not eating breakfast had any impact on weight loss. After 16 weeks, the researchers found absolutely NO difference in weight loss between the groups. The researchers concluded that breakfast being the most important meal of the day is merely nothing but a shared belief. That’s it. In other words, there is ZERO long term research indicating or proving that eating breakfast leads to lower body fat or increased metabolism. 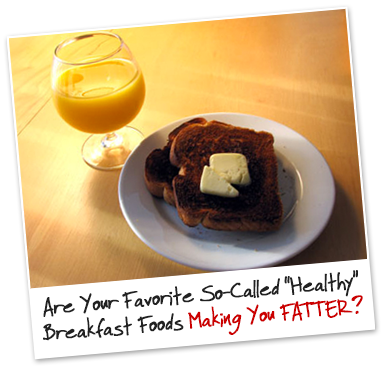 Typical breakfast foods like orange juice and wheat toast will spike insulin levels, sending your fat storage hormones soaring SKY high, making you go on a hunger binge—all while putting your body directly into a fat STORING environment. There are tons of studies out there that claim eating a big, well balanced breakfast helps promote weight loss. But in reality there are NO long term studies that show a direct correlation between eating breakfast and weight loss. In fact, according to Time Magazine …. In fact, SKIPPING breakfast altogether (a form of intermittent fasting) and eating your calories later in the day, say between 11am to 7pm or 12pm to 8pm, has been shown to increase anti-aging Growth Hormone , while BOOSTING your immune system  and regulating your hunger hormone (Ghrelin). As you can clearly see from the published research that breakfast is NOT the most important meal of the day… in fact, SKIPPING breakfast altogether may just be the MISSING link to your FASTEST fat loss. This is the backbone of The 16/8 Siesta Key Beach Diet, which is on sale for only $7 for the next few days. Each and every one of these benefits has been scientifically validated through peer reviewed published research, which is why The 16/8 Siesta Key Beach Diet is one of the most powerful health, longevity, and fat loss strategies on the planet. And for all you breakfast lovers out there? If you MUST eat breakfast, make sure it’s a “light” breakfast of high quality protein and friendly fats, but make sure you AVOID traditional high carb breakfast foods that spike your fat storing hormones (i.e. insulin) like pancakes, bagels, toast, and orange juice. Stick with light protein sources, like farm fresh whole eggs, along with some friendly fats, like coconut oil or raw nuts. This will help keep your body in “fat burning mode” for the rest of the day by stabilizing blood sugar. But my gun-to-the-head instinct is that you should still skip breakfast altogether at least 4 or 5 days of the week if you’re healthy. Using this strategy has allowed me to stay under 9% body fat for the last five years—and it also will save you a ton of time every day because you don’t have to deal with the headache of trying to eat every 2 to 3 hours. To your ultimate health and your fastest fat loss. P.S. Pregnant women and people with any type of diabetes should not skip breakfast or use the 16/8 Siesta Key Beach Diet. Harvie, M. N., Pegington, M., Mattson, M. P., Frystyk, J., Dillon, B., Evans, G., et al. (2011). The effects of intermittent or continuous energy restriction on weight loss and metabolic disease risk markers: a randomized trial in young overweight women. International Journal of Obesity (2005), 35(5), 714-727. Siegel I. Cancer Invest. 1988;6(6):677-80. Effects of short-term dietary restriction on survival of mammary ascites tumor-bearing rats. Mansell PI, Am J Physiol. 1990 Jan;258(1 Pt 2):R87-93.Enhanced thermogenic response to epinephrine after 48-h starvation in humans. Johnstone A., Int J Obes (Lond). 2015 May;39(5):727-33. doi: 10.1038/ijo.2014.214. Epub 2014 Dec 26.Fasting for weight loss: an effective strategy or latest dieting trend? Lee J, J Mol Neurosci. 2000 Oct;15(2):99-108. Dietary restriction increases the number of newly generated neural cells, and induces BDNF expression, in the dentate gyrus of rats. Mehrdad Alirezaei, Autophagy. 2010 Aug 16; 6(6): 702–710. Short-term fasting induces profound neuronal autophagy, doi: 10.4161/auto.6.6.12376. K Y Ho, J Clin Invest. 1988 Apr; 81(4): 968–975. Fasting enhances growth hormone secretion and amplifies the complex rhythms of growth hormone secretion in man. Yale University. “Anti-inflammatory mechanism of dieting and fasting revealed.” ScienceDaily. ScienceDaily, 16 February 2015. <www.sciencedaily.com/releases/2015/02/150216131146.htm>. De Bont R, Mutagenesis. 2004 May;19(3):169-85. Endogenous DNA damage in humans: a review of quantitative data and Johnson JB, Free Radic Biol Med. 2007 Mar 1;42(5):665-74. Epub 2006 Dec 14. Alternate day calorie restriction improves clinical findings and reduces markers of oxidative stress and inflammation in overweight adults with moderate asthma. ScienceDaily. ScienceDaily, 18 June 2015. <www.sciencedaily.com/releases/2015/06/150618134408.htm>.http://www.sciencedirect.com/science/article/pii/S193152441400200X Epub 2009 Sep 30. Short-term modified alternate-day fasting: a novel dietary strategy for weight loss and cardioprotection in obese adults.